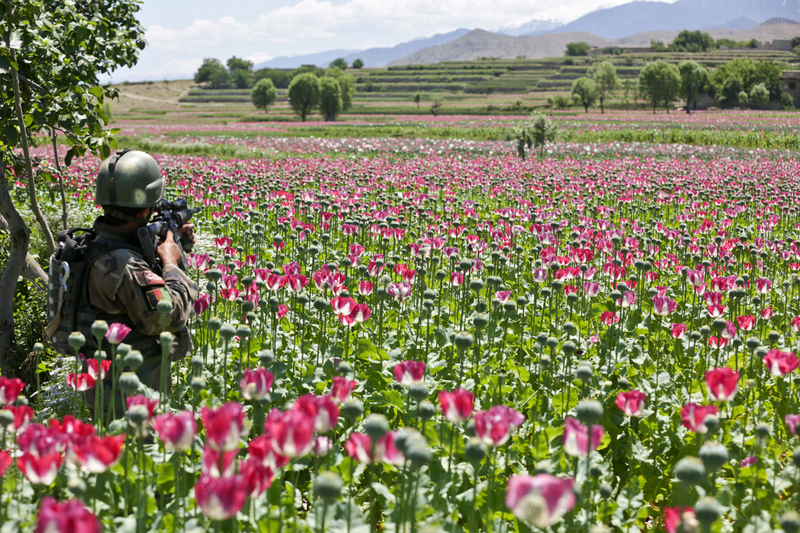 An ANA Commando with 3d Company, 1st Special Ops Kandak, covers a poppy field in Khugyani District, Nangarhar Province, Afghanistan, 9 May 2013. Legislators in Oregon passed state laws decriminalizing certain Schedule 1 Narcotics. The purpose of this decriminalization was to reduce pressure on state prisons and the state judicial system, which are overrun by nonviolent drug offenders. It is a sad fact that the United States has the largest penal system in the world, and at 2.3 million, the most criminals behind bars. Privatization of the penal system is a trend that requires careful monitoring and supervision. Indeed, we should have a national dialog on whether we wish to privatize our penal system at all. Legislation like Oregon's pales in significance when Federal law still criminalizes opiates, cocaine, cannabis, LSD, MDMA and meth, and most of all, when rehabilitation treatment for addicts remains ineffective and prone to recidivism. We are talking here about state laws. Not federal laws. When DEA decriminalizes specific narcotics and collaborates with HHS to provide opiate rehab based on buprenorphine in government clinics, then we will be fighting a winnable war on drugs, and it will not be a war at all. I have no informed idea how to address meth and cocaine addiction, so I will focus my remarks to opiates. My only thought is that legal medicinal cannabis could provide one option. I likewise have no thoughts on LSD abuse, other than the belief that LSD and other psychedelics are not inherently prone to addiction. Those rehab organizations that promote 12 step programs should be ignored into nonexistence. According to some studies, their recidivism rate exceeds 90-percent. They simply do not work, and are nothing less than a lucrative funding spigot for insurance companies. Seen another way, interdiction as drug policy, the "war on drugs," is a cash cow that turns on funding spigots for insurance companies and for local law enforcement from DHS and DOJ. This is why resistance to legalization and decriminalization will come predominately from those lobbies. It is about money. Such lobbies ignore the fact that nearly 50 years of record seizures never impacted the street price or the purity of illegal drugs, which are at unprecedented highs and will continue rising. That is the historical pattern. Another effect of nearly 50 years of drug wars is the militarization of police. Criminalization of narcotics makes we the people the enemy. It should finally dawn on us after decades of drug wars that criminalization and interdiction failed, and can never succeed. One undeniable indicator of the opiate market's durability is the fact that heroin kills its users due to overdose, and yet demand continues to grow. My solution is simple and rational. Government clinics contracted to HHS should provide prescribed doses of opiates under medical supervision, dispensing pharmaceutical grade narcotics to addicts. Those junkies who express a desire for rehab should be facilitated into government programs based on buprenorphine opiate replacement therapy, not 12-step therapy. Those junkies that combine government doses with street doses will inevitably overdose. They should be permitted to die. Narcan is an antagonist that reverses opiates. Those junkies who repeatedly overdose should not be resuscitated. We must have some limits. We should reward beneficial behaviors, and punish criminal behaviors. But we should do it in an enlightened, informed fashion, admitting that imprisoning nonviolent drug offenders for the past five decades is a policy that failed. Those junkies that comply with government programs should be maintained for as long as it takes for them to taper off under medical supervision, even if the timeframe stretches into years. The deciding factors should be the degree of addiction and the ability of the individual addict to tolerate a gradual decrease in dosage. Our goal should not be to give addicts a way to be high for free, though an argument can be made that this is ultimately more cost effective than prosecution, conviction and incarceration. Our goal should be to stave off the crippling symptoms of withdrawal, and to assist addicts in managing their addictions, helping them live productive lives despite them. Dosages should accordingly be prescribed by medical professionals, based on blood tests and other accepted methodologies that assess degrees of addiction and tolerances. Using pharmaceutical grade narcotics will enable precision, as well as offer a legal revenue stream to pharmaceutical companies. Our goal should be to assist functional addicts, and to grow their numbers. Many junkies can hold jobs and keep their families together with appropriate medical support. If junkies wish to receive sustainment dosages of opiates for life, remaining otherwise free from violent criminal entanglements, then they should be maintained for life. The cost savings in the reduction of street crime alone will overwhelmingly defray the costs of such programs. It goes without saying that safer streets, safer cities, and safer families, will ensue. Decriminalization of narcotics and effective rehab will dramatically reduce the pressure on our law enforcement, judicial, and penal systems, slashing the numbers of those who would otherwise be convicted of nonviolent drug crimes. This will further have a favorable impact on American families, shunting vulnerable populations into effective rehab, targeting the provision of effective life skills programs in coordination with educational and vocational authorities, liberating law enforcement to concentrate on violent criminals without distraction. Local law enforcement will need to find some other golden goose to fund militarization, as the cessation of the war on drugs and the decriminalization of narcotics will save us billions of dollars a year. Care will be needed to ensure that asset forfeiture is not further abused by law enforcement, as it has been historically, to seize funds without any court order. The other major benefit of such an approach is that it will position the government in direct opposition to narcotics smuggling cartels, and the negative impact on cartel earnings could finally prove definitive. When the government provides medicinal grade pharmaceuticals directly to addicts, it takes those addicts away from the cartels, at the street level. Further, when government supplies pharmaceutical grade narcotics to addicts, farmers in source countries will finally face competition that will incentivize them to grow alternative crops. If you eliminate the market for illegal drugs, farmers in source countries will grow something else. Banks will need to seek a replacement revenue stream as their profits from illegal drug laundering will crater, but they should not be laundering drug funds anyway. Cannabis should be legalized and regulated like alcohol. This is already happening at the state level, and more states will follow as the economic benefits of legalization become undeniable. Far from being a "gateway" drug, cannabis is a natural intoxicant that can supplant prescribed narcotics for pain management. When legal cannabis is available, there is less incentive for end users to purchase meth and cocaine, and a reduced lure to migrate to illegal street opiates. It goes without saying that cannabis smuggling will decrease to nonexistence over time, as Americans will buy legal American grown cannabis. Already there is market competition between GMO cannabis and organic cannabis. The free market should decide. It is also possible that medicinal cannabis can anchor therapies for opiate, meth and cocaine addictions. This possibility requires scientific research, and this research should be legalized and facilitated by the government immediately. In sum, certain states already decriminalize cannabis, with undeniable positive effects. Oregon went a step further, decriminalizing small amounts of meth, MDMA, LSD, cocaine, oxycodone and heroin. We can wait until other states imitate Oregon's example, or the Congress can pass federal laws decriminalizing narcotics. In any case, the war on drugs is all but over, and it failed. It is long past time to go another way.